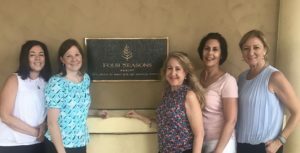 We recently stayed at the Four Seasons Orlando. Tucked right on campus at Walt Disney World, this resort brings a new level of quality to town. 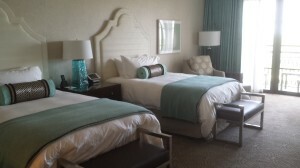 Sure, Disney has deluxe category resorts – but they have not really addressed luxury. 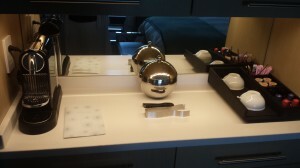 This is picture of a park view room – starting at a very comfortable 500 square feet. Each room comes with it’s own iPad for reading, listening to music and for ordering room service. Modern. Fresh. Another thoughtful touch is the bedside rechargeable flashlight. The bed was like sleeping on a cloud. It was probably the most comfortable bed I have ever slept on! The color palette is soothing – the fabrics are all very comfortable. There is a tv built into the bathroom mirror and separate tub/shower. Bathrobes and slippers are provided. Ample closet space. Thoughtful touches. Modern. Fresh. The coffee station with the Nespresso maker is another treat. 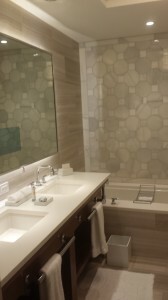 There is a built in refrigerator and an ice bucket which is filled at turndown service. In fact, “do not disturb” and “please service room” messages are managed through a wall key pad which alerts housekeeping when you are vacating the room or when you want to be alone. Thoughtful. Modern. From the park view room of my balcony I was able to view all three fireworks shows that night -Magic Kingdom, Epcot and the “Star Wars” Galactic Spectacular at Hollywood Studios! There are beautiful pools, top restaurants, a character breakfast, a spa and free drop off children’s club during the day. I also loved the outdoor ping-pong tables, pool tables and lazy river! There is no free Magical Express bus service to and from the airport. Instead you will pay about 70.00 each way for a car service. There are no single rooms that can sleep a family of 5. They do not offer roll-a-way beds. You would have to get two rooms connected to have enough bedding for everyone. 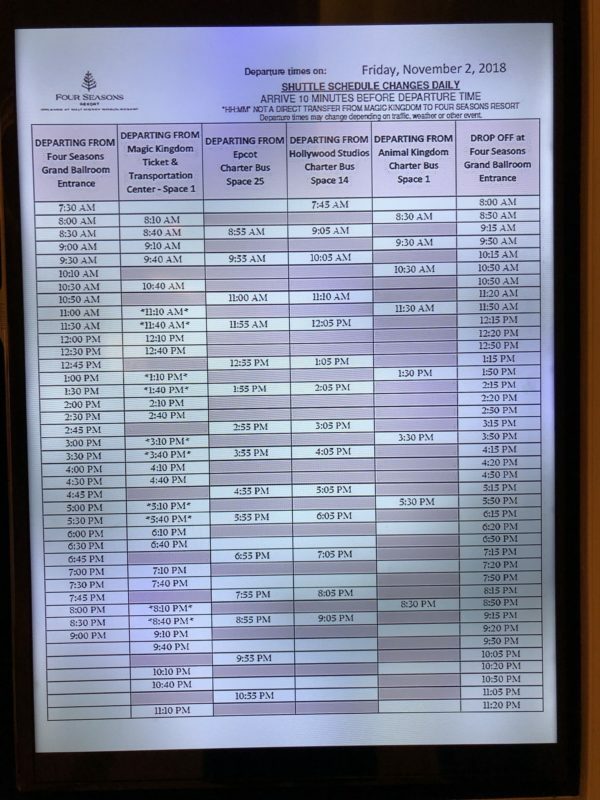 Four Seasons has their own bus schedule to the parks and while it is not continuous like the Disney buses (every 15-20 minutes) it is scheduled. So I can’t really consider this a trade off. The 5:05pm bus is there at 5:05pm – so I actually spent less time waiting compared with Disney transportation when you are never sure when the next bus will come. 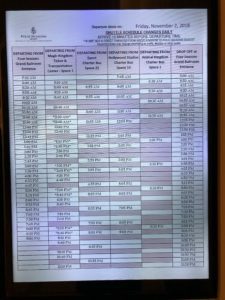 Transit times to Epcot and Hollywood Studios – about 10 minutes; to Animal Kingdom 5-10 minutes; to Magic Kingdom 10-15. The distance is similar to staying at Port Orleans Riverside or Old Key West. 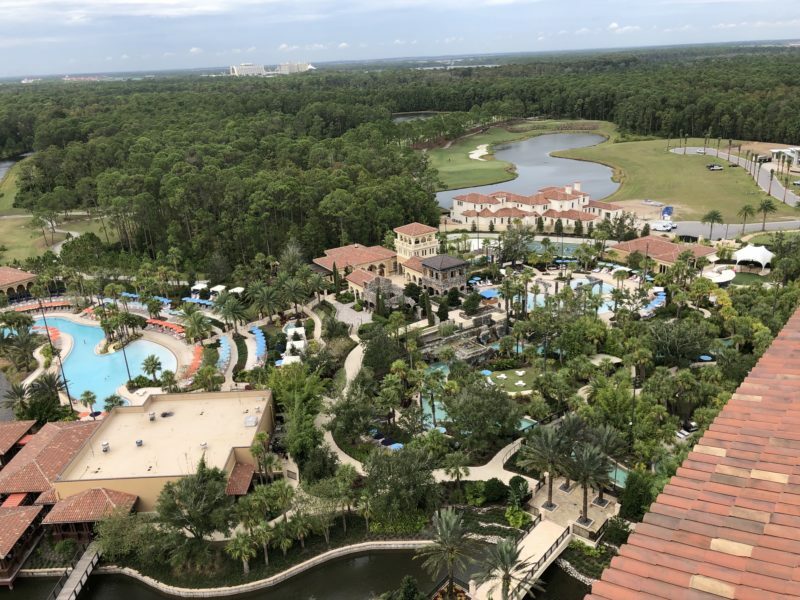 You might assume that this resort would cost more than a Disney deluxe resort – but you really have to have your travel planner do the math for you. 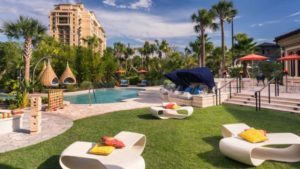 At certain times, there are promotions which can bring it in line with almost any of the deluxe Disney resorts. In fact, we recently priced this out and found the Four Seasons to cost less with a promotion. So who is this resort for? For families who want a retreat from the Disney scene, this is hard to beat. There is a comfortable elegance here that is a pleasure to be around. Disney resorts on the monorail (Grand Floridian, Contemporary, Polynesian Village) or next to Epcot (Boardwalk or Yacht & Beach Club) are going to offer unmatched location. But for people who don’t need the front row and put room and resort quality above location, this is your new home.